On Sunday, Dinesh Trivedi even played the dhol -- Bengal's version of the drum -- at this same event. Trinamool leader Dinesh Trivedi was seen dancing at an religious event in his constituency. Trinamool Congress leader Dinesh Trivedi on Wednesday was spotted doing something he has never done publicly before or at least in public memory -- dancing with abandon at a musical event in praise of Lord Krishna, at what is called in West Bengal a 'Horinaam SanKirtan". 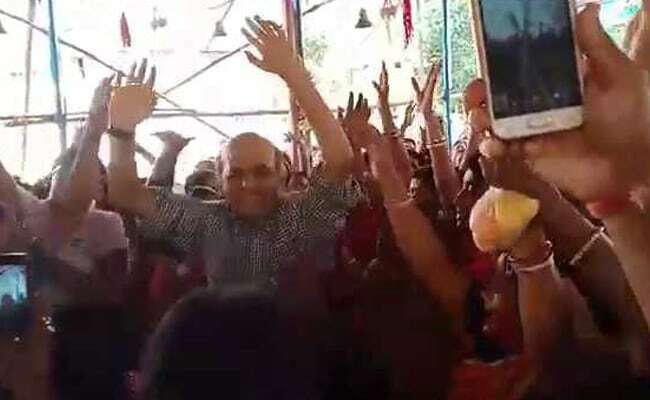 At the event in Vijaynagar, a neighbourhood in the Naihati assembly segment which falls under the Barrackpore constituency, which is represented by him in the Lok Sabha, the Trinamool leader was seen high in energy as he enjoyed dancing completely oblivious to cell phones filming his every step. But was it coincidence that Dinesh Trivedi hit the dance floor on a day his BJP rival was sharing the dais with Narendra Modi at Brigade Parade Ground in Kolkata? BJP's Barrackpore candidate Arjun Singh was Trinamool MLA till just weeks ago. He was known as a Trinamool strongman till he was denied the Barrackpore ticket. Trinamool's decision to put up Dinesh Trivedi from Barrackpore for the third time led to his walk out from the party and into BJP's arms. Trinamool dismissed his exit with thanks to the BJP for "spring cleaning the party" getting rid of the cobwebs as it were. But Arjun Singh has his sphere of influence in his assembly seat of Bhatpara and beyond. And the BJP machinery's support. Analysts see him as a real threat to Dinesh Trivedi. Barrackpore has a mixed population. Dinesh Trivedi's dance performance could be triggered by the need to deflect allegations against Trinamool of minority appeasement and keep the Hindu voters happy, voters who may find the BJP option attractive. On Sunday, Dinesh Trivedi even played the dhol -- Bengal's version of the drum -- at this same event. That day he was apparently wary of being filmed by mediapersons. But in three days, he had lost all such inhibitions.